Former world No 1 Chen Long is back to his winning ways when he clinched his first French Open title with a straight game 21-17, 21-19 win over second seed and 2016 champion Shi Yuqi in an all-China final in Paris on Sunday. It has been a remarkable run for Chen Long at the Stade Pierre de Coubertin as China swept to three titles in the French Open - winning the mixed doubles and the men's doubles. 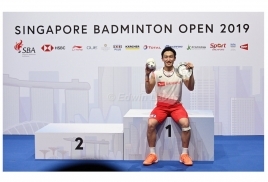 In the semi-finals, Chen Long dumped reigning world champion Kento Momota of Japan with a 21-18, 21-8 win. 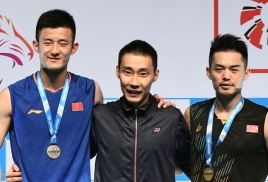 Chen Long was the man Momota beat to win his first Badminton Asia title in Wuhan, China in April this year. Another major upset was the defeat to world number one and top seed Tai Tzu Ying of Chinese Taipei in the women's singles. In a repeat of last year's final second seed, Akane Yamaguchi of Japan turned the tables on Tzu Ying for a 22-20, 17-21, 21-13 win in a 67-minute encounter. Indonesia's top seeds in the men's doubles Marcus Fernaldi Gideon-Kevin Sanjaya Sukamuljo fell to a shock 21-23, 21-8, 17-21 defeat to China's Han Cheng Kai-Zhou Haodong in 52 minutes. The same Chinese pair had beaten them in the China Open. World champions and fifth seeds Mayu Matsumoto-Wakana Nagahara of Japan snuffed out the only European finalists - Stoeva sisters Gabriela and Stefani in the women's doubles 21-14, 21-19 for the title as Asians swept all five titles at stake. In the mixed doubles, final top seeds Zheng Siwei-Huang Yaqiong of China needed only 37 minutes in their 21-19, 21-14 over Korea's Seo Seung-jae-Chae Yujung.